On an average, one hour of downtime costs businesses $474,000 in lost revenue. 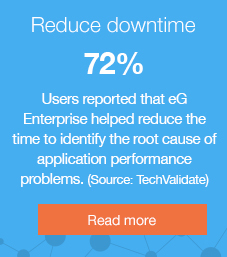 eG Enterprise helps you to monitor, pre-emptively detect and quickly resolve application issues. This way, you can prevent downtime and ensure great performance and user satisfaction and save your business tons of money. When application infrastructures are migrated, user experience is key. IT performance management & proactive monitoring helps you benchmark performance before and after migration. Comparing key metrics, you can identify problems introduced during migration and fix them quickly as they arise. Many a times, hardware is added indiscreetly in a bid to solve performance problems. This results in cost overruns and stalls IT transformation initiatives. 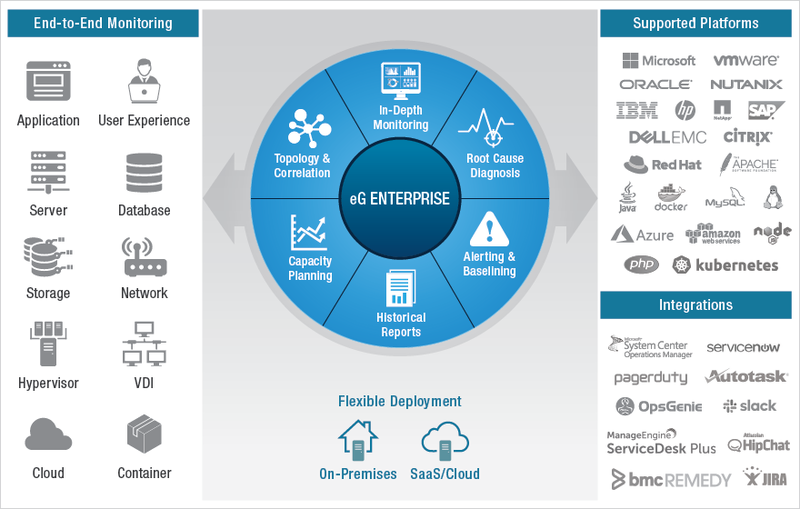 eG Enterprise helps you identify bottlenecks, maximize resource utilization and reduce hardware and software costs and to right-size your IT infrastructure. IT managers are looking for ways to scale their infrastructure – to support more users, new workloads, etc. eG Enterprise’s historical reporting and predictive analytics help identify bottlenecks in the infrastructure. Thus, you can determine where to make investments to allow the infrastructure to scale. By making it possible to diagnose problems with one click, eG Enterprise empowers helpdesk personnel to manage and troubleshoot performance issues. This way, organizations can significantly reduce their IT operations costs. Track user logins, access durations and application usage for compliance reporting. Alert on exceptions for immediate remediation. Detect and report history of configuration changes and cross-correlate with performance degradations. As IT infrastructures become software-defined, adding more hardware only alleviates performance problems temporarily. With visibility into the performance of every layer, every tier of the infrastructure, you can determine how to optimally utilize the current infrastructure investments to do more. Prior to release, get the diagnostics and actionable intelligence you need to eliminate any bottleneck areas. Immediately after deployment, get the deep visibility and insights you need to troubleshoot and resolve new issues quickly. By identifying the cause of problems quickly, eG Enterprise helps organizations resolve performance issues quickly, reduce service downtime and thereby increase user productivity and satisfaction. eG Enterprise helps businesses detect and fix problems in advance, before users complain. Since every minute of downtime and slowness costs thousands of dollars, eG Enterprise offers tangible and significant cost savings. eG Enterprise empowers IT helpdesks to play an active role in day to day IT operations. Instead of merely acting as a pass through, IT helpdesks can take care of initial problem identification and triage, so just the right IT experts are involved in troubleshooting a problem. 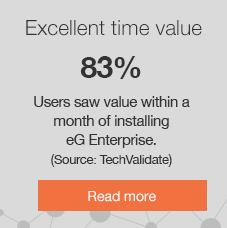 With eG Enterprise in place, IT experts spend less time fire-fighting routine problems. They are only involved when complex issues crop up. Thereby, these expensive resources get more time to spend on productive activities that yield higher returns for the organization. IT organizations invest millions of dollars in new initiatives around virtualizing servers and desktops, migrating versions of applications or moving applications to the cloud. eG Enterprise’s total performance visibility provides organizations just what they need to identify and fix performance bottlenecks in a timely manner, thereby ensuring the success of the new initiatives. eG Enterprise’s universal insight technology provides IT managers and architects just the visibility they need to optimize their IT infrastructure. By balancing load, understanding usage patterns and bottlenecks, they can decide how to reconfigure their applications and servers to support the maximum workload. Empirical data provided by eG Enterprise helps organizations plan efficiently for future growth.